Thanks to all the participants of All You Can Sweat - CNY Edition! 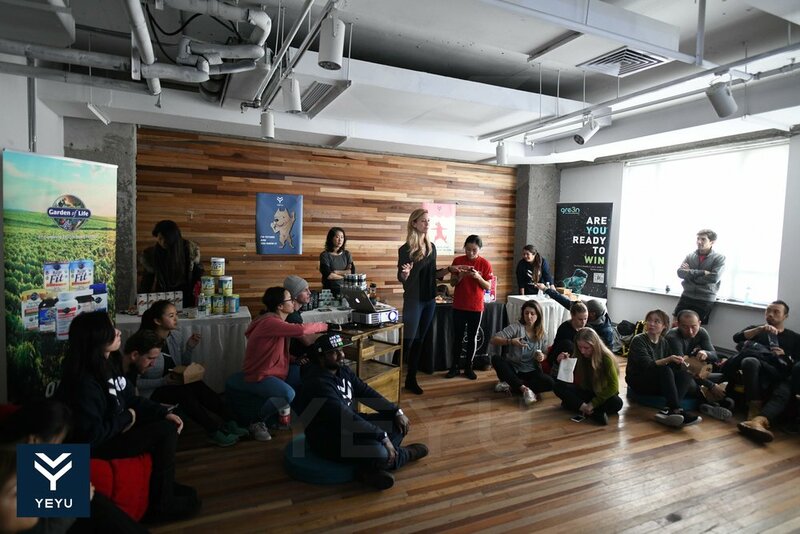 YEYU’s third community activation event was another milestone for us, and we hope that those who were there could share the same feeling. At YEYU we believe that every community can interact with each other without any exclusivity and for everyone’s interest and gain, and at All You Can Sweat - CNY Edition we proved it for the third time! We aim to be a unique bridge that connects different realms of the fitness world such as sports providers, brands, and people, and only with the join efforts of those entities together we can make to get there. The day started with a boxing class at Golden Gloves given by the energetic Penny, Nick and Frank from WeBox, where participants could learn some of the basics and go for drills and pad works. Next door, a more relaxed atmosphere with the carismatic Ganesh, who was giving his asana yoga class. In the morning we could also enjoy the elegant and technical moves of the Chinese traditional martial arts, Wing Chun (you may know it from the movie IP Man), from the Wing Chun Club, which showed us their skills in close range contact. The second slot of the day was dedicated to Shena Board, Zumba and Body Strength. Habi from Primal 6 showed us how to use the Shena Board, an ancient training tool used by martial artists to improve their flexibility, balance, and coordination. Zumba class with Daria spread electrifying vibes, while in the other space people were having a blast with the full body strength workout led by the super energetic George from Feel Good Fitness. Around lunch time people could have a rest from the workouts, enjoy a snack and attend workshops about wellbeing and healthy lifestyle with Lizzie from Zenergy and Jay from 9Fulfillers. At this time the place was packed of enthusiastic and curious people, willing to prove themselves on new kind of trainings. It was the time for one of the most popular and though trainings in the world: INSANITY. In a full-packed gym, Richardson’s energy made everyone perform better than expected! Yoga with Jade from Free Soul Yoga gave a completely different feeling. In a more tranquil atmosphere, everyone could enjoy relaxing vibrations and listen to their body. Bethany and Andrew from Paradigm Fitness gave an inspiring lesson on how to never give up and reach our goals through mental toughness and discipline. The early afternoon was dedicated to another boxing class with WeBox, and the first spinning class of the day with Todd from Spinback, with a fast and sweaty 45 min ride. Next to the bikers room people could experient the elegance of Acro-yoga with Cesar. For those who still had some energy left, the last three classes of the day included BJJ (Brazilian Jujitsu) with Yunus from SHBJJ, another successful spinning class, and an amazing Boot Camp with Alex from AFit. We want to thank everyone who joined All You Can Sweat - CNY Edition. We were glad to have you there training, sweating, dancing and mingling with us! We want to keep providing you with more events like this in the near future. We promise to keep the surprises going with new amazing sport activities if you’ll keep spreading the YEYU love and help us improving with your priceless suggestions! Thanks to all our partners for this Event: from the instructors to the location providers, from the vendors to the speakers. Your presence and commitment was much appreciated, your expertise and availability made the difference, and made the day enjoyable and fun for everyone. A special thank to FitSpace, a perfect location to hold an event like All You Can Sweat. 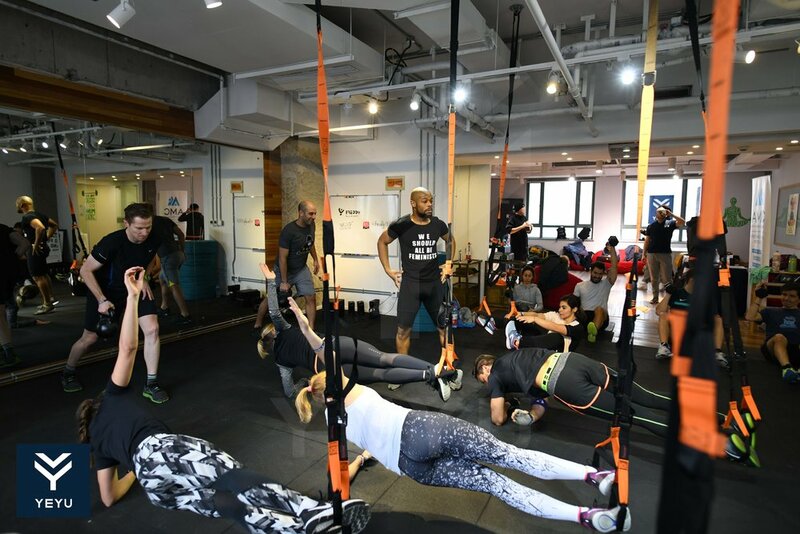 In case you are considering to organize a sport event or a fitness class, Co-Fit, newly opened fitness studio located within FitSpace, offers trainers or gyms the opportunity to use the space on a flexible hourly basis to grow their business and expand their reach within Shanghai’s fitness community. Classes could include yoga, TRX workout, HIIT, boot camps, body conditioning, dance and much more. The YEYU Team hopes to see YOU ALL again at the next community activation event! Until then, enjoy the YEYU App and help us making it better! Only with your valuable help and feedback we can be what we want to become: A sharing sports world created by everyone, and the largest network of connected and interactive sports communities in the world! Along with FitHearts, an organization dedicated to raising funds and awareness through sports to support like-minded charities and NGO's, we want to create a unique experience for everyone who loves fitness and sports. At YEYU, we believe that united we can achieve the impossible, that’s why partnered with FitHearts, we want the whole industry to work together on a sole mission: to make Shanghai healthier and happier through sports while raising support and awareness for the FitHearts foundation. Always wanted to try that new activity but didn't have the opportunity? We bring it to you, that's what YEYU is about. Learn more about different sports. On top of that, we will have many other treats: YEYU goodies, massages, vouchers, discount deals and much more. So, bring your tracksuit, yoga pants, tank top, water bottle, cat, dog, kids, Ayi and Shifu. Did we mention free activities with amazing coaches, delicious healthy food & beverages, massages and free goodies? Save the date, Saturday October 28th at 11am to 4pm. Download YEYU to discover more and join the classes for this amazing event. Featured Event on YEYU - RideNow Tibet - The Roof of the World! Cycling has always been one of the most popular sports in China. In big cities like Beijing or Shanghai, it’s easy to find varied cycling groups and join them for a city cycling, night cycling, mountain cycling, etc. Moreover, China Qinghai Lake Cycling is well-known for it’s difficulty and natural views. It becomes more than just a sports when you combine cycling with hiking, traveling or other activities, for some people, it’s a new way of discovering wonderful places and challenging themselves.This week, we introduce you an exciting cycling event in Tibet, one of the most beautiful places in China. There are interesting events coming up almost every week that helps sports enthusiasts to find different kind of activities for their spare time. In order to better share these amazing activities with you, we are going to pick out the most popular events on YEYU for you from time to time. This week, we introduce you to a perfect outdoor activity for summer time: River Hiking organized by M2adventure.